Posted April 9th, 2019 by Jim Sinclair & filed under In The News. Canada’s major cryptocurrency exchange QuadrigaCX has been officially declared bankrupt, local media outlet CBC reported on April 8. Quadriga’s bankruptcy was reportedly approved today by Nova Scotia Supreme Court Justice Michael Wood, and follows the court monitor Ernst & Young’s (EY) recommendation that it should be declared bankrupt earlier this month. EY’s legal team then argued that the ongoing restructuring process for QuadrigaCX under the Companies’ Creditors Arrangement Act (CCAA) should shift to an alternative process under the Bankruptcy and Insolvency Act (BIA). The ruling now grants EY enhanced investigative powers as a trustee under the BIA, which means the company can require production of documents and testimony from witnesses. Posted April 8th, 2019 by Bill Holter & filed under In The News. Horses, a puppy, and beer…what’s not to like? Is A Gold Backed Italian Lira Coming? We Still Think So! Gold is higher after a restful weekend in the states with the trade at $1,302 (June) , up $6.40 and right beside the high at $1,302.30 with the low at $1,295.50. Silver is totally held back with its trade at $15.14, up 5.4 cents with the high at $15.16 and the low at $15.075. The US Dollar is down this morning, but the charts point to higher climb in the long run, with the value pegged at 96.805, down 19.7 points and close to the low at 96.765 with the high at 97.02. All this of course was done way before 5 am pst and the Comex Open. The Venezuelan currency now has Gold pegged at 13,003.73 Bolivar, a huge 104.87 gain since Friday’s post with Silver gaining only .55 Bolivar at 151.211. April Deliveries for Silver have stopped for some reason with the demand count still stuck at 75 requests for physical with Zero Volume up on the board so far this morning and since last week’s Wednesday count. Silver’s Overall Open Interest shows a slight drop from Friday’s increase with the count losing 149 Obligations totaling 204,897 Overnighters as we wait for the delayed data to be updated. Europe still seems to be a mess these days as the Yellow Vests protestors are still out and about in France, starting its 22 consecutive week of tax payer’s revolts with Immigration Issues abounding in Greece as fake news sets up another riot. Then Italy says it right! Gold “.. Belongs To The People, Not The Bankers” – Italy Moves To Seize Gold From the Central Bank. We’re pretty sure the ECB is not too happy about this at all, since they have to make statements surrounding the precious metals subject all the while court cases are everywhere surrounding how the precious metals have been eased into these cheap prices via paper receipts that seem to disappear into the City of Chaos where it seems they are trying to disappear the Brexit Vote as well. Posted April 7th, 2019 by Bill Holter & filed under In The News. CIGA Tom with a string worthy of replacing the quote at top of JSMineset! Posted April 5th, 2019 by Bill Holter & filed under In The News. CFTC Deep State Insider exposes the Precious Metals Manipulation…Game On! The manipulated price of Gold is now trading at $1,291.50, down $2.80 with the low right here at $1,285.90 and the high to beat at $1,297.80. The manipulated price in Silver is now at $15.085, up 1/10th of a penny with the low right here at $15.065 with its high at $15.175. The US Dollar is also as flat as the precious metals with its trade at 96.92, down ½ of a 100th doing the exact opposite of the real money sector and is closer to the high at 96.94 than the low at 96.81. All this of course was done way before 5 am pst and before the Comex Open. Venezuela’s currency situation now has Gold priced at 12,898.86 Bolivar losing 23.97 overnight with Silver pegged at 150.661 Bolivar gaining .749. After yesterday’s EXPLOSIVE Ted Butler article and the facts he presented, it is our opinion these price swings in the emerging market currencies, are about to happen in the primary currencies (imo) because of the CFTC’s past hidden transgressions against the price of Silver and Gold. April Silver’s Delivery demands remain unchanged from yesterday’s count leaving 77 contracts with Zero Volume up on the board since Wednesday’s close to now. All the proof in the world regarding the precious metals manipulations is right behind the pricing mechanism that utilizes massive short positions to manipulate the price with the Overall Count in Silver adding another 3,469 obligations in order to stay the price illegally (that is unless the CFTC ordains the trade) bringing the total count to 205,046 Overnighters with the largest portion of these shorts being JP Morgan (Must read Ted Butler’s latest). Posted April 4th, 2019 by Bill Holter & filed under In The News. The Algomated Shorts in Gold continue to restrict all upward movements with the trade now at $1,293.90 down $1.50 and as usual close to the low of London at $1,293.50 with the high at $1,297.90. Silver is worse off because it needs more pressure to control with its price at $15.01, down 9.2 cents and right at the Maginot Low of $15. The US Dollar is seeing more support from all the activities in Europe with the value pegged at 96.77 up 10.8 points inside a 20 point trading range between the low at 96.605 and the high at 96.805. All of this non-volatility of course happened before 5 am pst and the Comex open. The Venezuelan Bolivar now has Gold priced at 12,922.83 taking back some of the gains it attempted during yesterday’s trade with Silver now at 149.912 losing .899 Bolivar in value. April Silver Deliveries are pressing forward with the demands for physical now at 77 obligations waiting for receipts with Zero Volume up on the board so far this morning. This means 20 contracts were settled out yesterday, somewhere between the Comex and the City of London, where we still have no idea if these receipts that are sent over there actually get settled out in physical, cash, or at all. Silvers Overall Open Interest continues to climb, proving a gain of 1,915 more shorts to stay the price now totaling 201,579 Overnighters as we head towards breaking 245,000 held overnight contracts that were required when Trump won, when he entered office, and when the population of Britain did it’s Brexit vote. In our opinion, this is where it all breaks down, which is why we focus on the numbers behind the price. Italy’s economy is not doing so well these days as the not so united Europeanization populations continue to complain about the EU’s burden placed upon all employment and purchases (income and taxes) as the … Italian stocks tumbled on Thursday after the Italian Treasury once again slashed its forecast for economic growth for 2019.” Then more reasons get added for holding precious metals.. This debt mountain threatens the financial stability of Italy and the future of the euro: Any plans to strengthen the single currency must solve the question of who will bear this burden.” The Euro Leaders of course feel the people should bear their entire burden, but the people no longer want this political union anymore, which is why we hold physicals. Posted April 3rd, 2019 by Bill Holter & filed under In The News. This early morning positive report shows Gold trading higher, adding $2.30 to the closing price, at $1,297.60 (June) after reaching to $1,299 with a low at $1,294.50. So far, only 70,650 contracts traded while London was labeled as being open with the Open Interest at 326,122 (June). The Volume will gain huge amounts all the while Comex is open and the movement in price stays the same. At least everyone in the scheme is getting paid including the governing bodies who are supposed to protect us as they too get algo generated commissions, profiting those who can trade within a few pennies daily using tens of thousands of positions which are used against the individuals and corporations that use this system to find real pricings. Silver is following the leader with its trade up only 3.9 cents at $15.10 with the high to beat at $15.16 and a low at $15.07. The Dollar’s rally seems to be taking a breather with it price pegged at 96.61, down 31.3 points and closer to the low at 96.525 with the high at 96.89, all this was done way before 5 am pst and the Comex Sleep. The Venezuelan Bolivar sure has been going thru some sort of correction with Gold now at 12,959.78, gaining back all of yesterday’s fall and some of Mondays as well proving a gain of 38.95 Bolivar overnight with Silver gaining 1.048 Bolivar at 150.811. Sorry… We are (conveniently) experiencing technical difficulties. Our team is working on the issue and we will be back soon(er or later). Posted April 2nd, 2019 by Bill Holter & filed under In The News. Gold is flat in our early morning report with the trade at $1,293.70, down 50 cents and ironically, trading closer to the high at 1,295.30 with the low at $1,289.50. The Silver signal is pointing lower with the trade at $14.995, down 10.5 cents and near its bottom at $14.965 with the high up at $15.085. The US Dollar is still the go to currency with support showing up within the European trading session giving the trade 16.1 more points of support so far with the value pegged at 96.96, after reaching up to 97.045 before calming down with the low to beat at 96.845. All this was done way before 5 am pst and before the Comex sleep. Very little news is coming out of So. America leading many to suspect more is going on within the emerging markets currency melee especially within Venezuela, where Gold’s price is now pegged at 12,920.83 losing another 18.98 Bolivar with Silver now at 149.763 Bolivar, losing .699 overnight. April Silver’s delivery demands sure got a large distribution completed during yesterday’s trades with the count now at 197 obligations waiting for receipts with a volume of 10 up on the board so far this morning. Proving 509 contracts (over 2,500,000 ounces) were needed immediately making this pullback in price very interesting indeed. The numbers behind the price swings are telling, as the Overall Open Interest increased again while demand for physicals did the same with the count gaining 2,153 totaling 199,556 Overnighters. Maybe if we see more demands for physicals, we’ll continue to see lower prices, go team Algo! Most of us come to this conference to discover what mining assets are worth financially. Most people go to financial conferences generally to discover what various assets are worth. For almost 20 years my organization, the Gold Anti-Trust Action Committee, has documented why mining assets particularly and other assets generally can not be valued accurately or even valued at all without first taking into account the largely surreptitious intervention in the markets by governments and central banks, surreptitious intervention that lately has become almost comprehensive. Another real reason the Fed cannot ever raise interest rates…it is called shooting one in one’s own foot! Jim Grant: The Fed Was Technically Insolvent Last Year. Why Didn’t Anyone Care? In finance today, comfort trumps propriety. As necks are tieless, so are earnings “adjusted.” As shirts are untucked, so are balance sheets encumbered. In the 21st century way of doing business, freedom of action is the beau ideal. Neither clothing nor rules should constrain it. Has anyone noticed that the Federal Reserve is solvent again? Unlikely, as few realized that it was technically insolvent. At the Sept. 30 reporting date, cumulative unrealized losses in the system’s open market account totaled $66.4 billion, almost twice the $39.1 billion of capital available to absorb that hypothetical loss. These are matters of form, not function, you will hear. The Fed does not mark itself to market. It pays its earnings into the Treasury, rather than retaining them. And it returned to technical solvency in the fourth quarter on the back of the year-end bond rally. Posted April 1st, 2019 by Bill Holter & filed under In The News. 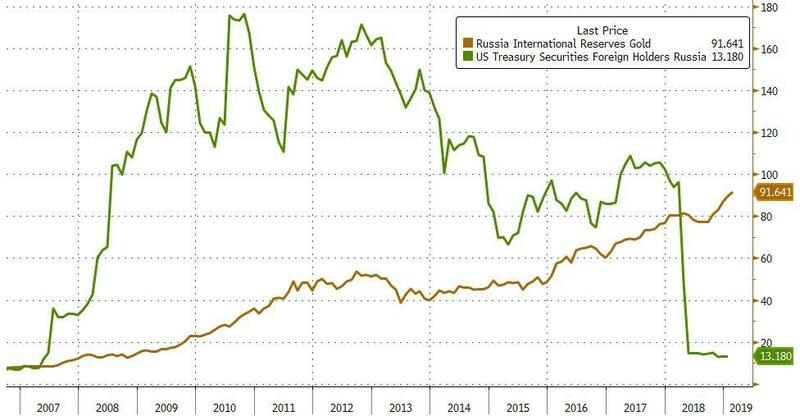 With Russia actively dumping US dollars and buying gold at the fastest paced in decades, the writing is on the wall when it comes to what the Kremlin thinks of any possibility for a detente in the painfully strained US-Russian relations. And with Russia now clearly seeking to end monetary ties with a dollar-denominated “west”, there is just one alternative – China. Which is why it will probably not come as a surprise that several Russian banks joined the China International Payments System (CIPS) also known as China’s “SWIFT”, to ease operations between the two countries, according to a senior official at the Central Bank of Russia (CBR). “As for the cooperation on payment systems, a range of banks are already connected to CIPS, allowing to facilitate payments routing procedure,” Vladimir Shapovalov, who heads a division dealing with foreign regulators at the CBR’s international cooperation department, said earlier this week during the international Russian-Chinese forum. Gold starts off our Monday down $2.90 with the trade at $1,295.60, approximately $3 off the low at $1,292.60 and almost equal to the distance from its high at $1,298.50. Silver is also down just a little with the trade at $15.065, off by 4.5 cents with its low at $15.03 and the high to beat at $15.145. At least the US Dollar is doing the exact same thing that is dropping in value, with its trade now at 96.69, down 15.5 points with the low at 96.61 with the high at 96.835. All this was done sometime way before 5 am pst and before Comex’s opening, we’ll call “the big sleep”. The value of Gold in Venezuela is now priced at 12,939.81 Bolivar, losing another 26.96 in value since Friday’s early morning report with Silver now at 150.462, barely losing .15 of a Bolivar as we hope to see the big change everyone knows will occur, sooner than later. The Argentinian Peso is now showing Gold has gained 16.3% with Silver gaining 17.5% since the first of this year as we wait for more emerging chaos to occur in the very near future. April Fool’s day starts off with the Silver delivery demands at 706 contracts waiting for receipts either here or in London with a Volume of 13 posted up on the board so far this morning. Once again showing us all, the “delay in live data” is in total observation mode, showing once again, the OI count is unchanged from Friday mornings quote, helping to prove Comex is no longer leading anything but following, even in the most valuable and worthwhile data feed. This delayed data shows that Silver’s Overall Open Interest lost only 297 contracts (that only an April fool would believe) as we are forced to wait for Comex, which is why we want to blockchain all of this, making for a more accurate and “live” data feed. Apparently the British love politics as a heaping pile of Teresa May Delay is still a major part of Friday’s leftovers that is carried over to now as the UK will ‘likely’ leave Europe without a withdrawal deal on April 12. Yeah right! And Teresa May will come up with another “wonderful” idea, another vote, just before that date. Whose side are the politicos on anyways? Politics has failed completely, Teresa May has delivered 2 and ½ years of Nothingburger and has been saying all along “My Deal or No-Deal with no time left to do anything else.” British Voters? Who needs them? Definitely not the politicians! All voters do, is get in their way. Page queried in 0.677 seconds.